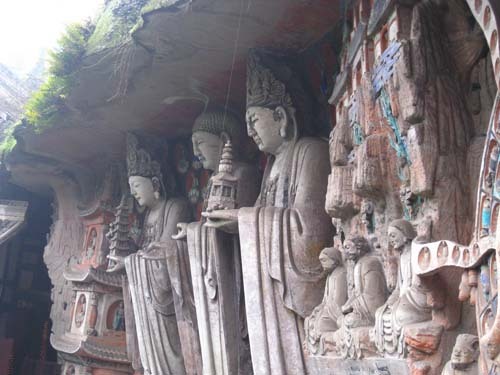 Dazu Grottoes(大足石刻), or Dazu Rock Carvings are a collection of cliffside carvings in Dazu County. The collection is composed of the rock carvings in Beishan, Baodingshan, Nanshan, Shimenshan as well as Shizhuanshan, all of which are of the highest artistic quality and demonstrate the most exquisite skills. 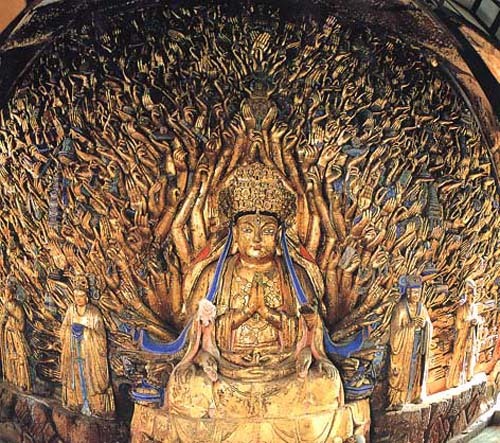 The Dazu Rock Carvings were commenced during the Tang Dynasty (650) and continued through the Ming Dynasty (1368-1644) and the Qing Dynasty (1616-1911). They are as famous as the Mogao Cave in Dunhuang, Gansu Province. The rock carvings in these places are very distinguished both at home and abroad. Among the rock carvings, there are more than 5,000 statues and over 100, 000 Chinese characters of inscriptions and epigraphs. 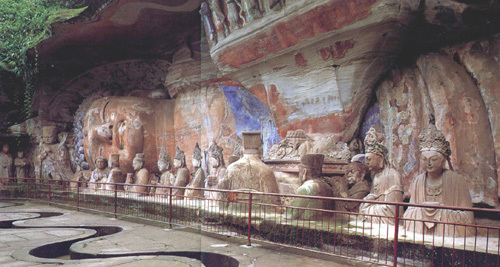 The Buddhist statues dominate in this rock carving group, and the Taoist and the Confucian stone figures can also be seen.